THERE is high possibility that the current voters’ list is bloated with as many as 120,000 dead or non-existent persons, making it vulnerable to fraud, corruption and overall sinister agendas. This is according to former People’s National Congress/Reform (PNC/R) Executive, James McAllister, who recently examined the figures of Guyana’s most recent census; voters’ list and voters’ turnout. In a Facebook post on Saturday, he broke down these figures explaining that there must be some ulterior motive afoot that would cause any political party to be against the holding of fresh house-to-house registration. “Even if we assume a 100 per cent, this scenario points to a high incidence of substitute voting. This is when someone impersonates an elector and votes in his or her place. It’s quite possible that the present voters list is bloated by as much as 35 per cent. Anyone suggesting going to elections with such a list has a sinister agenda. The PPP claim that such a list could be cleansed is just a plain joke. There must be house-to-house registration before elections in 2020,” McAllister concluded. In the 2019 budget, the government had allocated $3B towards fresh house-to-house registration to be conducted by GECOM. However, prior to the allocation and even now, Opposition Leader Bharrat Jagdeo has opposed new registrations, contending that the Guyana Register Office (GRO) can provide this function. These are not the sentiments of GECOM Chair, retired Justice James Patterson, who back in March 2018 asserted that the only way to ensure that cries of malpractices by parties become a thing of the past, is to nip it in the bud. “Looking at the past, see what has gone wrong in the past and remedy it and to see what we can anticipate in the future and block that,” he told the Department of Public Information (DPI). However, McAllister is not the first or only individual to have found inconsistencies with the voters list, as the same was highlighted by GECOM Commissioner, Vincent Alexander, and other Ministers of Government. “I am an advocate for house-to-house registration. I am not only an advocate, but one who is aware of the institutional decision taken years ago that we should have registration every seven years; and that we haven’t means that we do not have what is considered to be the ‘best list’,” Alexander told media operatives earlier in the year. Government Chief Whip, Amna Ally, told the Guyana Chronicle recently that she believes that the current voters’ list is “compromised” and one which has already been used by the opposition to solicit illegal votes. Her contention is also that many persons who have now attained the eligible age to vote would be disqualified if the old list is used. Alliance For Change (AFC) Chairman, Khemraj Ramjattan, had also cautioned the same while A Partnership for National Unity (APNU) General-Secretary, Joseph Harmon, had assured that house-to-house registration would achieve more than GRO could. “There’s a whole process that leads to the production of a list of electors for an election and that process requires registration; it requires claims and objections and all of these issues are dealt with in this process. GECOM has to make the authoritative statement on the matter. GECOM is the custodian of the list and GECOM is the entity that will be responsible for ensuring that we have a clean list,” he said. What these jackasses stating that 120K voters died since 2015? They weren't concerned about dead people in 2015, now they wake up. BTW, not 120K dead people voted but 120K dead people eligible. WHEN the seven-member Guyana Elections Commission meets today, it will deliberate on a work plan presented to it by a technical committee, which will determine the amount of time the body needs to prepare for general and regional elections. Chief Elections Officer Keith Lowenfield is reported by Demerarawaves as telling reporters on Monday that he presented copies of the work-plans to members of the Operations Sub-Committee. The online news outlet reported that when asked if the current voters’ list was good to run off a general election now, Lowenfield said “The list is clean; it has a life until the 30th of April” and “depending if the Commission so decides”. 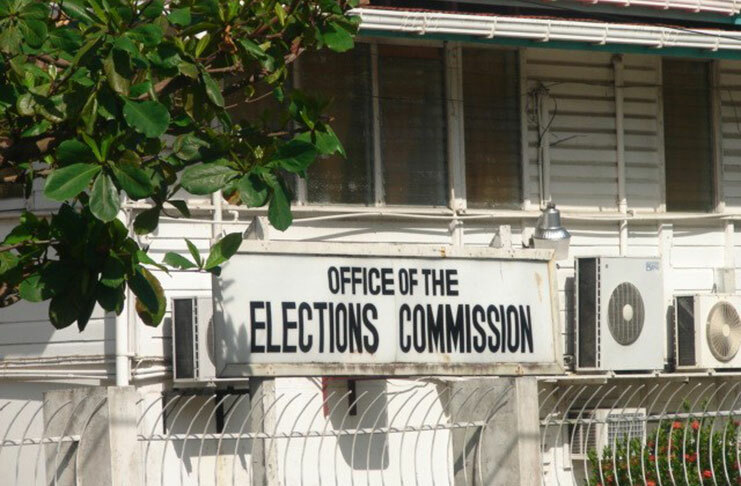 But at least two commissioners– Vincent Alexander and Desmond Trotman– have been adamant that the voters’ list must be cleansed before any elections. However, even before the meeting, the Commissioners were once again at odds as the People’s Progressive Party (PPP)-nominated Commissioners are bent on approving a March, 2019 elections timeline. Benn said the documents presented by GECOM give one timeline of July 2019 and another for about six months after house-to-house registration. The work plan, presented to the Sub-Committee on Monday, was prepared by the GECOM Secretariat and handed over to co-chairs Commissioners Sase Gunraj and Charles Corbin, and members Desmond Trotman and Benn. Gunraj had also confirmed to the newspaper that he received same around noon that day. The Commissioners had agreed last week to recommence progressive deliberations following previous stalemate on the matter. 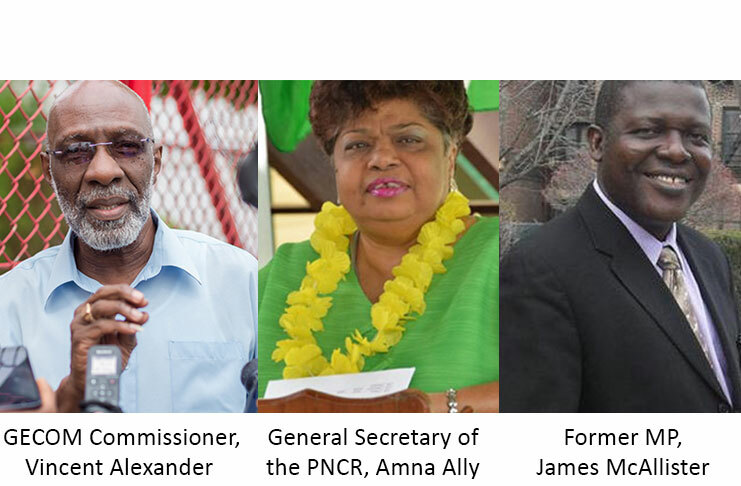 The coalition parties believe that the current voters’ list is “compromised” and would be a grave injustice to Guyanese should the country move forward with it to elections. The parties said the list consists of thousands of dead persons and does not include many now eligible to vote. “I believe that the list is compromised. This is not only a list that we have to take off dead people or people who are removed from the community, this is a list where the PPP used their returning officers, in the villages where people are pro-PPP, to move people from one area to the next during local government elections and, therefore, we consider the list compromised,” People’s National Congress/Reform (PNC/R) General Secretary, Amna Ally, told the Guyana Chronicle last week Wednesday. These are issues, she added, that the coalition parties have noticed in past and even the most recent elections. Ally said in Region Nine (Upper Takutu-Upper Essequibo), persons were moved by certain political affiliates from the neighbouring town of Bonfim in Brazil to Lethem with the aim of having them vote as residents. She noted that this is only one example and similar illegalities have occurred in places such as Coomacka; Hosororo; Wainaina and Mabaruma. On January 31, 2019, acting Chief Justice (CJ) Roxane George-Wiltshire had ruled that the passage of the no-confidence motion was successful and, therefore, elections are to be held within the 90-day timeframe. However, several ministers of government and members of society do not believe that GECOM can be ready for elections in the remaining days. Many are calling for the $3B budgeted house-to-house registration to take place as this would clear the current list of dead persons and enable now- eligible persons to vote. In addition, the fact that Article 106(7) of the constitution provides for an extension of the 90-day period required by “not less than two-thirds of the votes of all the elected members of the National Assembly [to] determine,…” is now the reason for much debate. PPP padded the list and yet lost still their worshippers here think next election will be a runaway..hehe. The more I see of PPP's actions the more I think the govt should stay its course and not give in to their (PPP's) crooked schemes. GECOM is an independent body but has and can be influenced by politics.The padded list benefited the winner, now under scrutiny by James McAllister [a former PNC MP] it clearly shows the PNC padded the list. This is old fashion PNC Rigging election. Meanwhile keep practicing pulling out them false teeth to do your job when pnc bais come around. Since 2015, 120, 000 people had died? Hard to wrap my arms around this facts. jackass, pnc drive them to death, where you bin? Mass suicide in Guyana, ask Cain. The list has never been correct. Like all things Guyanese, laziness and inefficiency. But note the deceptive tactics of KP...suggesting that the 120K dead people actually voted. I'm being charitable to him by saying he is deceptive. He might actually be dumb and not undestand what he read. It was good enough for yall rass in 2015 though. Double standards just to stay in power. Not laziness but intentional deceit. Now you want to bring fantasy into politics? Get serious, ok.
Why the taxpayers paying all these half dead PNC cults on the GECOM, maybe their names are on the Dead list. Yes, reptile you went to school all 12 months even on Sundays. The PNC had 31/2 years to clean up the voters list, just tell me what have they been doing all this time, filling Ballot boxes for 2020. Boy, is your own people exposed the slackness and figures, so read what James McAllister wrote, when you were in prep school I was at UG. 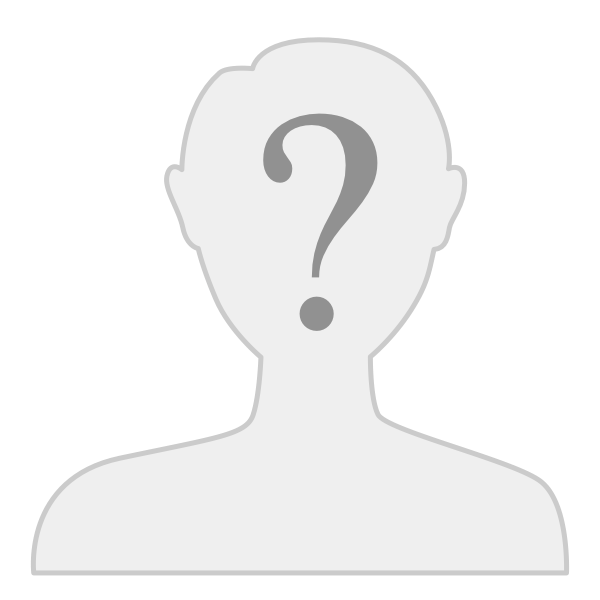 "Government Chief Whip, Amna Ally, told the Guyana Chronicle recently that she believes that the current voters’ list is “compromised” and one which has already been used by the opposition to solicit illegal votes." This is why BJ was shocked..he realized even though he padded the list...they lost. Funny how the PNC is clamoring to claim how incompetent they are. Another straw clutching endeavor. Stupid has no limit with FOOLS. BJ working at GECOM?? Damn Al Yuh STUPID fuh real Banna. Rass, she nah bin know this in March 2015? The PNC is quite aware of the DUMBNESS of their supporters home and on GNI!!! O rass, it looks like only dead people voted for PNC at LGE ! Dem rass are looking for a good trashing at National Electons.
. The PNC had 31/2 years to clean up the voters list, just tell me what have they been doing all this time, filling Ballot boxes for 2020. Boy, is your own people exposed the slackness and figures, so read what James McAllister wrote, when you were in prep school I was at UG. After 28 years of Burnham dictatorship, the PPP had 23 years to clean up the list! Never happened, suh now they telling idiots like you that 120K people dead in 3 years. And the idiot you are, you believe it. My sympathies that you were at UG and not afforded an undergraduate and graduate education in North America. Might explain why you are so patently IGNORANT and pedestrian in your thinking! The title of th is thread debases t he seriousness of the fraud being foisted on us here. For the list to have 120K dead people on it means we have been compiling dead for over 3 elections cycle without any rehab work being don. We know that is bollox since it was deemed intact for the 2011 when it was completely rehabilitated. Alexander considers himself a bit of a statistician so he should know this amount of error in the system is pure fabrication. At most it can have around 25K or so. I want to see a free and fair election and there should be no doubts whatsoever about the accuracy of the list so if that number is accurate then we need a new list for the next election. The next election will be a well fought and close one so both parties need to have a clean list. It would be interesting to see if GECOM reports on whether some of those people actually voted ! Django, Chief, Prince, Mitwah, and Leonora are among the names of the dead on that list. So Gecom didn’t do their jobs. The current list is adequate. GECOM is trying to delay the election to give the PNC time to consolidate their strategy. ...an I hear we bai Druggie on the gettin lucky handicap list. That list also contains all the people who have legally migrated and those who have overstayed their visas in NA. PNC trying to get lucky. These frigging people are a curse to democracy in Guyana. huh . . . what is the basis for this childishness? do you know ANYTHING about the man's qualifications? "lucky" . . . huh?? how exactly is purging the rolls of these non-residents not enhancing "democracy" in Guyana? The current list is adequate. you do understand that Guyana has less than 800,000 people, right? 25,000, or even 10,000 illegal votes under these circumstances is a scandal that cannot be called "democracy"
A simple solution, let the 120K people who dead bring dem death certificate before they are allowed to vote. He does....I do know his qualifications. His posturing on this point is political and one does not have possess a substantial vitae for such activity.